Even if you have medical insurance whether it's through your employer, an Affordable Care Act plan or Medicare, that doesn't mean you'll never have any problems with medical bills. 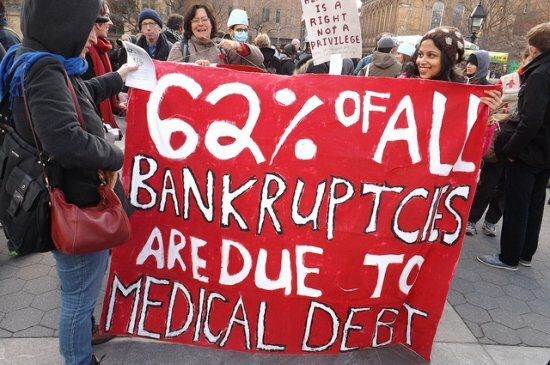 And if you don't have insurance, even a minor illness can cause an insurmountable debt crisis. When you're dealing with the after-effects of an injury causing accident or significant illness, that's already stressful enough. Add medical bills and aggressive debt collectors to the mix, and you've got a crisis brewing. But there are steps you can take to get these bills under control. Check out these five tips to deal with medical bills you can't afford. When you're dealing with an original creditor, ask for a detailed, itemized listing of what you owe. Compare this to your insurance policies to make sure you're not overcharged. If it's a debt collector, ask for the same. If they can't produce documentation of the debt, they won't be able to sue you and may go away. Also, check on the statute of limitations on the debt. If the bill is older than three years (or if it's more than three years since your last payment), they won't be able to sue you which can offer some peace of mind. Calling before 8 am or after 9 pm. Calling you at work when you've informed the collector you can't get calls there. Continuing to call you after you sent in a written request asking they stop calling you. Using profanity, abusive language or making threats of violence. Threatening to come to your home or have you arrested. Calling your friends or family and telling them you owe money. If a debt collector abuses you in any of these ways, keep a log of the instances including names, dates and what was said. You may even record these calls to prove your case. Notify the debt collector you're reporting them and then do so. You can make a report to the North Carolina Department of Justice, the Federal Trade Commission or Consumer Financial Protection Bureau. The original medical provider may or may not be open to negotiation. If you have no insurance, ask if they can offer you a better rate since you're uninsured. They may offer you a discounted rate. Sadly, rates charged to the uninsured are often higher than those charged to insured. Medical providers negotiate maximum fees they can charge to insured patients while they are free to charge the uninsured any rates they want. Once the bill is in the hands of a debt collector, you are much more likely to be able to negotiate a lower payoff since they bought the debt at a discounted rate. You may also want to offer installment payments, particularly when you are dealing with the original medical provider. Let them know how much you can reasonably pay each month (don't overestimate because you don't want to fall behind on payments) and ask them to work with you. You can also offer to make payments after you haggled with them on the amount of the bill. With a debt collector, they may also accept installment payments. However, be careful with this. The statute of limitations on a medical debt in North Carolina expires three years from the date the services occurred or the date of your last payment on that debt, whichever is longer. If the debt is set to expire soon legally, making a payment resets the clock and may not be a wise strategy. Medical bills are a type of debt that can be completely wiped out in a Chapter 7 bankruptcy and may be lessened or eliminated in a Chapter 13 as well. This can be particularly helpful if you had a one-time medical crisis like an accident or illness like cancer that you've now recovered from but still have bills for treatments that you can't pay. If you have ongoing medical issues, bankruptcy can wipe out the back bills but won't address the bills that continue to pile up after you file so may or may not be a fit solution. Consulting with a reputable bankruptcy attorney will help you understand your options and the best approach for your unique circumstances. Contact the law offices of John T Orcutt for a free consultation at one of our convenient North Carolina locations in Raleigh, Durham, Greensboro, Fayetteville, Wilson or Garner. Call 1-888-234-4181 and ask about our zero down bankruptcy special.